Coll. No. 1682.1, 28 June 2017, characters observed: Perennial herb, to 60 cm., in very wet places; Stem, erect and branched at base decumbent to ascending, proximal hairs weak, 1 mm., eglandular; Leaves, compound, palmate and ternate, petiole 0-62 mm. + blade 37 mm. × 40 mm. 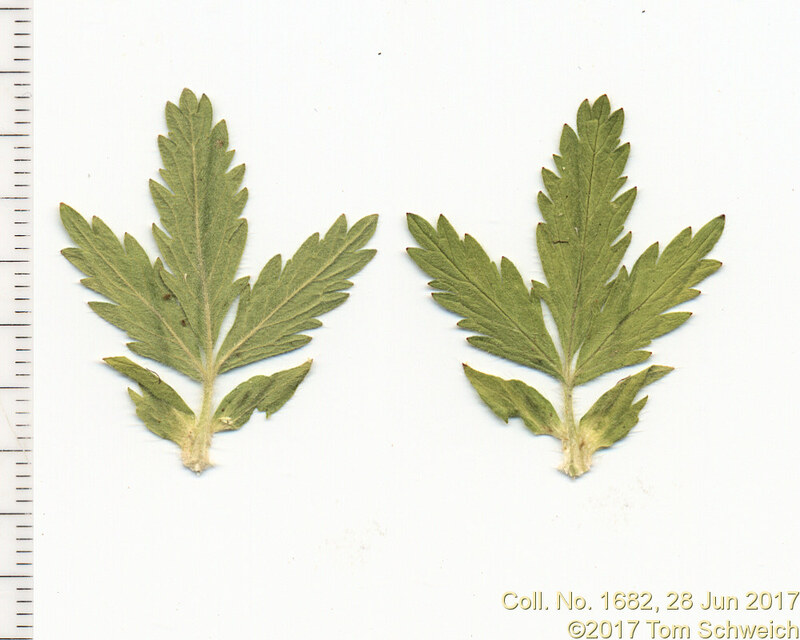 wide, leaflets, 3-5, both sides, green, sericeous, hairs weak; Sepals, 3 mm., green; Petals, 4 mm. × 2.5 mm. wide, yellow; Style, 0.7 mm. ; Achene, 0.9 mm., light greenish-brown, smooth, maybe very minutely pappilate. Field Notes: Coll. No. 1682.1, 28 Jun 2017. Other photos about Species - Rosaceae or Rosaceae Potentilla rivalis.